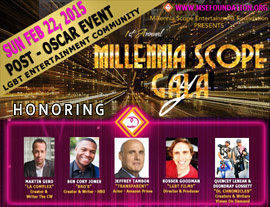 2nd ANNUAL MILLENNIA SCOPE GALA – Post Oscar Event celebrating filmmakers of LGBT Television and Film planning is in full SWING!! If interested in participating contact me here.. The EXCITING & AMAZING must see post event Wrap up and Video link below. — celebrating LGBT Pride with Quincy Gossfield and 2 others atLos Globos.